Mix the warm rice with vinegars and oil. Taste and adjust to your liking. You may present it in the bowl, which is traditional, or plate it up. Use whatever combination of toppings that happens to be around the kitchen. I make it slightly different every time. Bonus points for using a dolsot (stone bowl) which may be procured at your local Korean market such as H-Mart. To use, place bowl directly on cold burner. This works equally well on gas or electric stoves. Bring up to medium-hot. Coat the inside of the bowl with a squirt of sesame oil. Spoon in the rice and arrange the toppings. Crack an egg, preferably quail, against the side. 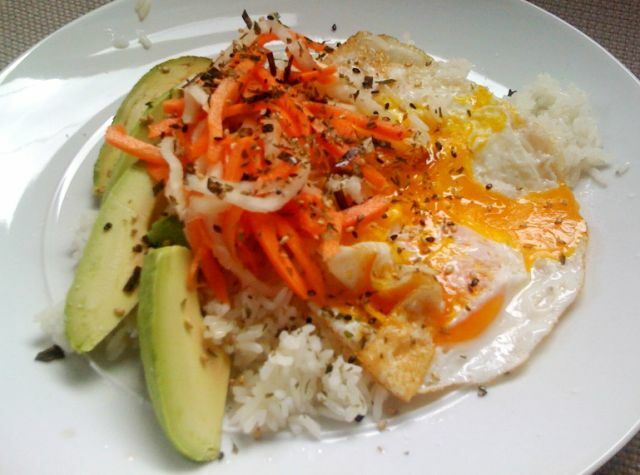 The rice and egg with sizzle as they get delightfully crunchy. The only care for the stone bowl is to rinse with hot water. Never use soap as it will soak into the porous stone and taint the taste of the food.